Hi Mike: We headed out about 9:30 am Thursday morning Jan. 26th from Michigan and made the 6-hour trip to northwest Illinois, to a place along the Mississippi River. The normal gang was along for the hunt, good friends John, Ryan, Mike and Jason. My dad Russ did not make the trip this year but I told him I would keep him posted with the play by play if we got some action. The weather was pretty good, mid-teens at night and mid-20s during the day. Winds were a little stronger than we would have liked, about 15 mph average with gusts over 25 mph but the direction was ok. The wind was not too bad in the lower areas where we call. Those bottom lands had almost no snow, but we had a good couple inches of fresh powder on the hilltops and sides. Mike and I decided to make our first set at Jessie’s draw, a spot that has produced coyotes almost every year we have hunted it. It’s a large ravine that runs the better part of a mile downward from the hilltop. We made our way to the stand location, sneaking in behind some pines so as not to be spotted by any game that was down below. We set the Foxpro between us and Mike started with some coyote vocals, then rolled into some distress house cat sounds. Going back and forth between the two for 28 minutes I was thinking nothing was going to show. But then a coyote popped out, scaling the bottom of the hill about 100 yards away. 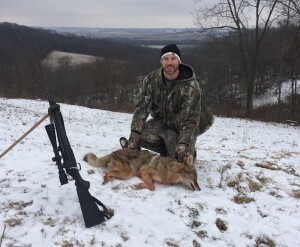 Soon as it cleared the brush I gave a mouth bark to stop it and put it down with my T/C Venture chambered in .243, with a 70-grain Nosler ballistic tip that Mike had hand loaded for me. It was a nice-size male, good way to start the day. For our 3rd set of the morning we went to another part of the property that has produced for us in the past as well. As we were approaching our setup we noticed something moving across the hilltop about 600 yards away. Turned out to be a coyote heading down into the draw we were just about to call. He hadn’t seen us, so we made the decision to get into position quickly and see if we could call him in before he got too far away. Mike set up on the closest finger coming out of the large draw and facing the coyote. I looked over the next finger back, in case he tried to flank us. Mike ran the same coyote howls and then some distressed cat sounds with the Foxpro that he did earlier. About 15 minutes later I heard a shot. After he finished the call I walked over to see a guy grinning from ear to ear. 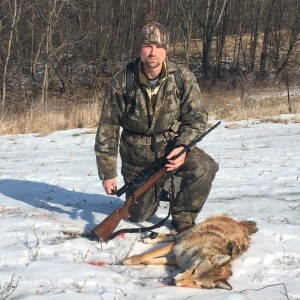 Mike had just scored his first kill with his new Cooper rifle chambered in .204 Ruger. 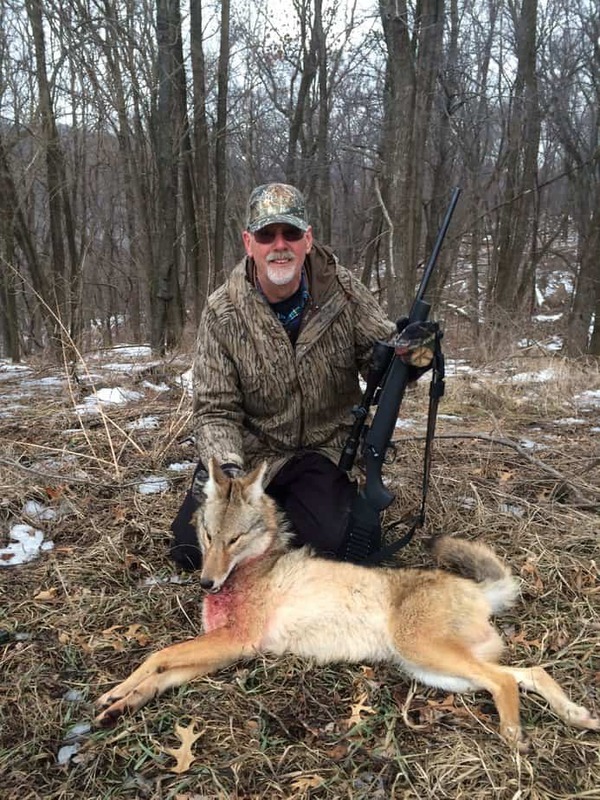 The coyote had come running right to him along the hilltop and he was able to stop it with a mouth bark at 40 yards; he put it right down with a 35-grain handload. It was a large male that weighed in at 45 pounds! I sent dad text messages telling him that we had scored on a couple. The winds picked up in the afternoon and we didn’t have any more luck the rest of the day. That night we found out that we had gained permission to hunt a large piece of property where we used to call a few years back ago. Excited to hear this, we set a game plan for the next morning. John, Jason and Ryan would try to cover as much ground as they could with the wind direction we had. On the first set John and Jason set up on a point overlooking the intersection of two large ravines. John set out his Foxpro and started calling with a TT Frenzy rabbit distress. About 5 minutes into the call a yote came running right in. 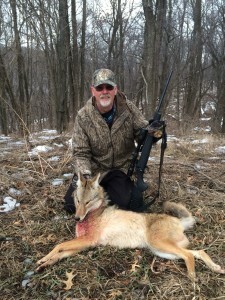 John gave a mouth bark to stop him at 80 yards and took him with his Tikka .223 using 55-grain Hornady Vmax ammo. Another nice male coyote. On their 3rd call of the morning John and Jason made their way down the steep ravine and back up to another nice ridgetop. They set up in a new spot where they could see a good ways off. John started with the TT Frenzy again and about 3 minutes in, a coyote came running in from the bottom. John gave a mouth bark to stop and when he squeezed the trigger the gun dried fired. The coyote, now on alert, took off running and Jason was able to crack off a shot at about 50 yards and put it down with his .22 Hornet. It was a nice-colored female. Jason has been 4 for 4 with that gun since he’s had it. The 35-grain Hornady Varmit Express does a good job on the predators. After hearing from John that they had called in two within an hour using the TT Frenzy sound I said to Mike, “I guess we better try some rabbit sounds!” The wind had switched directions a little on the way to our next set so we decided to call a tall ridgetop overlooking a huge valley with a power line clear cut running through it. 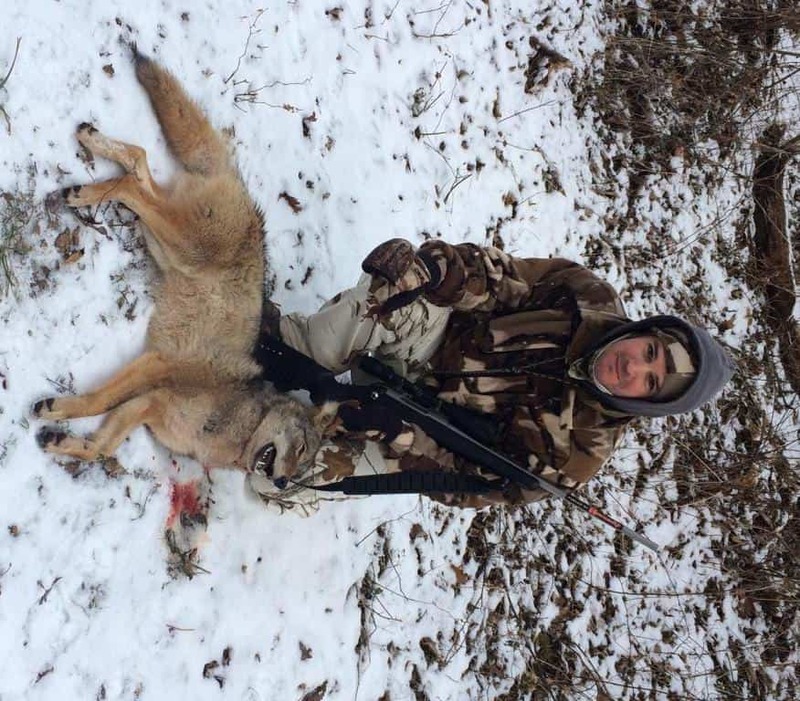 I placed the FoxPro call between Mike and me and started with the TT Frenzy. It wasn’t much past a minute and I caught movement out of the comer of my eye. I turned to the right and saw a coyote trotting down the finger toward me, trying to get downwind. The critter disappeared in the ditch between us. In a slightly controlled panic, knowing the yote may catch our scent soon as it popped up, I spun around and tried to pick the spot where it might show. A few seconds later it appeared 40 yards farther to my right than I had thought. I gave a mouth bark as soon as it cleared and took the shot. The animal disappeared and I wasn’t sure if I had hit it. Mike and I walked over and saw it lying 15 yards down the ditch. That was number 5 for our trip! I texted Dad to let him know we had just killed 3 in about 2 hours. Ryan was not able to have any luck getting a yote, but did find a nice heavy shed antler while walking in to make a call. We left it for the property owner that had given us permission to hunt the property again. Hopefully 2 dead coyotes and a shed antler on his property will earn us an invite back in the future! We had another great hunt and are already looking forward to next year. 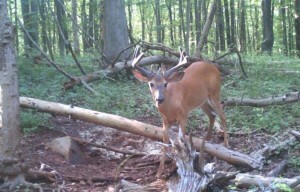 Our friends Zach and Ellie sent this great buck, first time they have ever seen him on their farm. Double beam, can’t wait to see how this rack turns out in full. Good looking 8-pointer growing on one of the farms I hunt. Got a lot of red foxes in our VA county, they have long been protected here because “the hunt” chases them on horses and with hounds, a long-standing tradition. 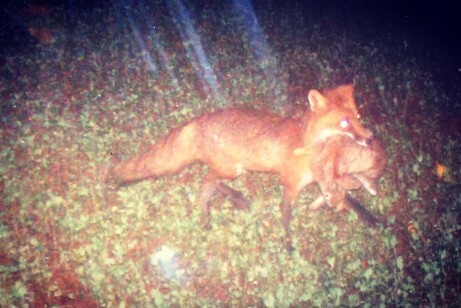 This fox grabbed a late-night snack of juicy rabbit at 2:28 a.m. one day last week. 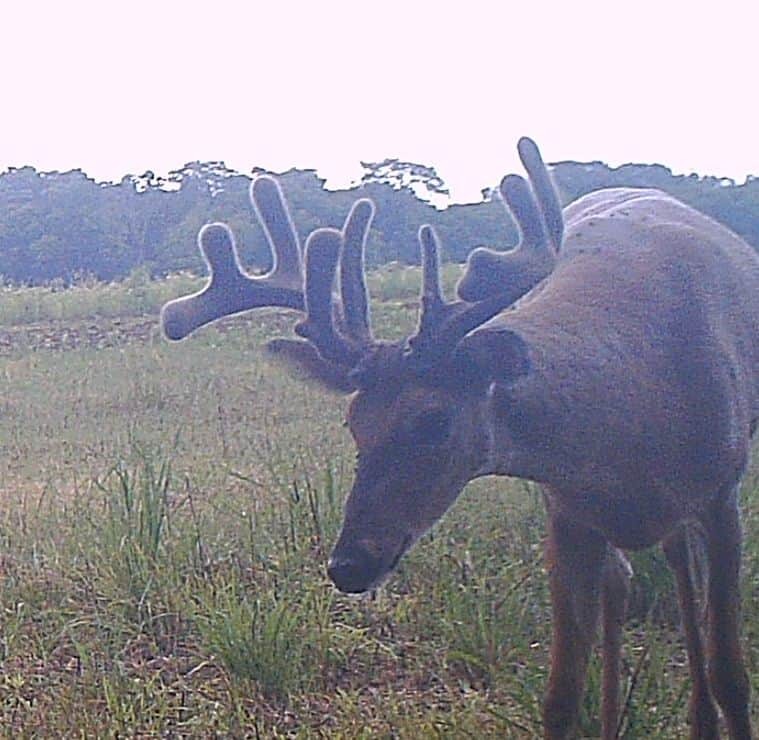 Another look at a split-brow buck our friend and blogger Danny has eyes on. Send me your pictures to share (mikehanback@yahoo.com) I’ll always keep the location of your target bucks top secret. Will a Doe with Fawns Attack You or Your Dog? I saw a teaser for an article “Deer Relentlessly Attacks Woman” and naturally had to check it out. As the story goes, Cindy Frost spotted a weird-acting doe and fawn on her Ohio property two weeks ago. Since then, she has tried to avoid the doe, but it stares her down, becomes agitated and won’t leave her alone. Cindy says that last Thursday, she was out with her dogs when the doe became extremely aggressive, reared up and charged her! Cindy ran and “(the doe) came right after me,” she said in another highly melodramatic and breathtaking moment. “What saved me was my black top. (The doe) couldn’t get her grip, that’s the only thing that saved me.” Cindy said she fell during the altercation and suffered minor injuries. Pardon the tongue-in-cheek, but whitetails are not dangerous game folks. Yes, every year in early June you hear about isolated cases of does getting aggressive, but it’s very rare. And it’s rarer still that a doe would actually charge and make contact with a person. In most of the cases we do hear about, like Cindy’s, dogs are involved. Dogs are in a yard where a doe and fawn wander near…or somebody is out walking her dog and happens to come across the deer. Either way, once in a blue moon a doe perceives the dog to be a predator, a coyote, and approaches and/or rears up to protect her fawns. Local police and experts with the Ohio DNR related this message to Cindy, and told her the deer should move on in a couple of weeks. 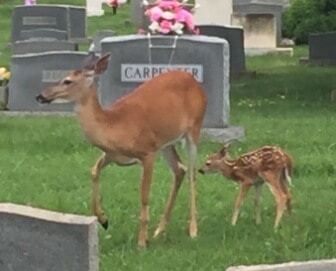 But if the doe continues to be a problem, both doe and fawn might have to be euthanized. Hopefully Cindy will play it cool, watch her step and maybe stay inside her house like a “prisoner” for a week or so until the doe takes her little one and goes away, and this event will have a happy ending. 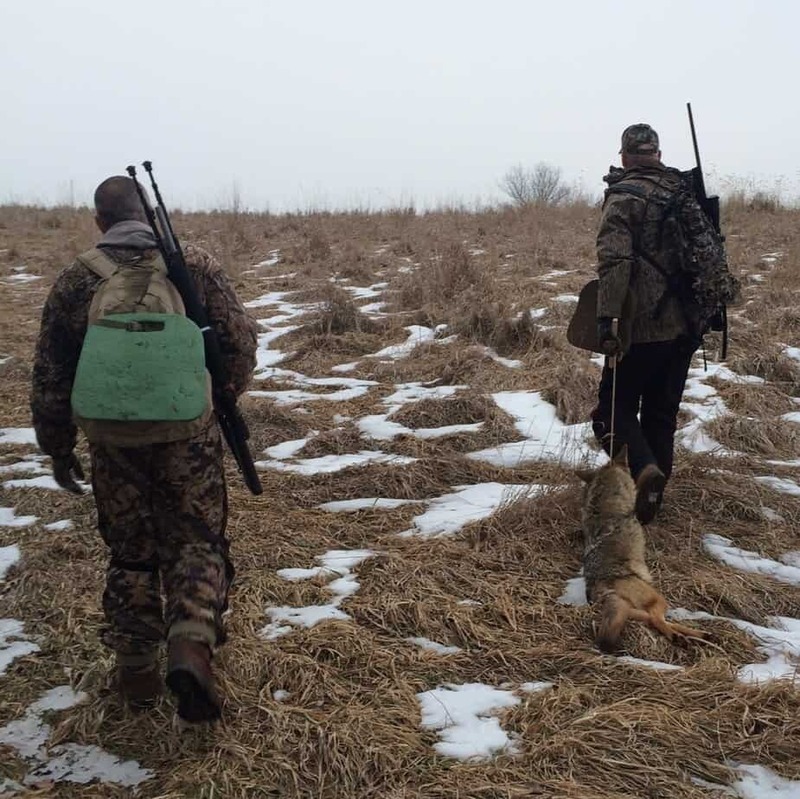 Hi Mike: We had a great coyote hunt the other weekend in Illinois. We hunt along the Mississippi River in the northwest corner of the state. Weather was great, low in the teens and highs in the upper 20s and 30s. Most of the snow was melted with some hard icy spots left, so it made it a little difficult to sneak around and into our setups. Still, it was much better than previous years when we have had 12 to 24 inches of snow to deal with! All of our normal group made it, my buddies John, Jason, Ryan and Mike, and Dad and me. Dad mentioned this may be his last year going with us, so I was hoping we could put a big coyote in his lap and make it a successful hunt for him. We hunted in two groups of three the whole time, which seems to work pretty well. The caller and one or two guys covering downwind and watching the back door. On the second call of the morning I set my FoxPro on top of a steep ridge and called down into some bottoms, with Dad and Mike sitting downwind of me. I started with some bird distress calls for a few minutes, then after a slight pause I added some raccoon fight sounds. About eight minutes into the call I saw a coyote pop up from the bottom about 80 yards from me. He was limping in slowly on a hurt front leg. He got to about 60 yards and stood still for a moment, but right behind a large branch. I started lip-squeaking at him, and as he cleared the branch I put him down with my T/C Venture .243 using a Barnes Vortx 80-grain tipped triple shock. Nice male coyote that weighed around 30 pounds. About an hour or so later my buddy John also scored on a nice coyote. John, Jason and Ryan had set up in one of our best spots overlooking a large ravine where we have killed a coyote almost every year. 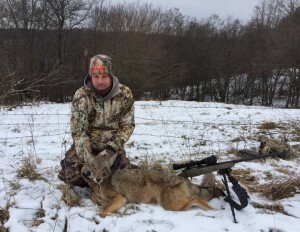 John called with his FoxPro as well, using distressed rabbit sounds and switching between DSG & TT Frenzy. About 14 minutes, the critter came trotting along the bottom of the ravine. John put it down at about 80 yards with his Tikka .223 using 55-grain Hornady Vmax ammo. Later that evening, an hour or so before dark, we set up on another large ravine that has produced in the past. 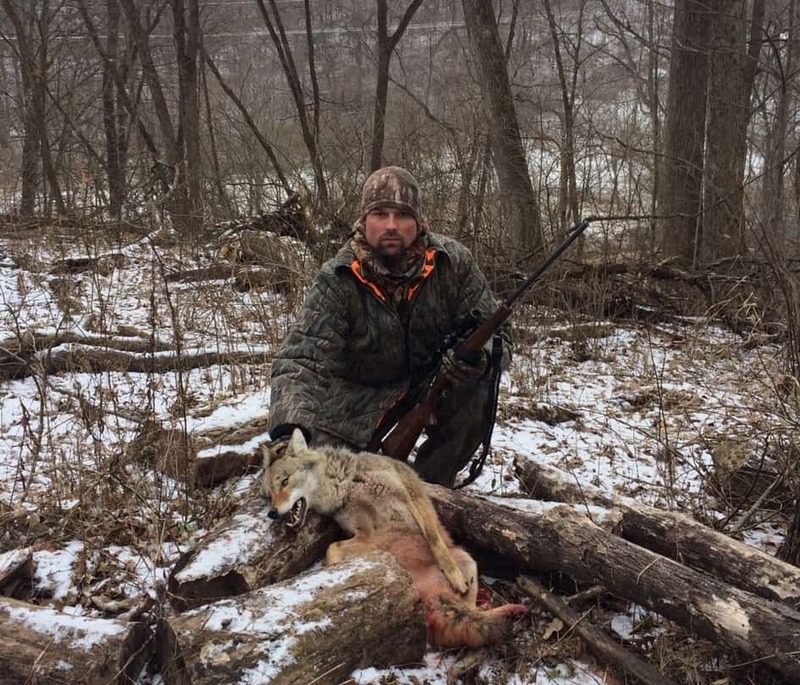 Mike was calling with his FoxPro and hit a coyote howl–a pack of them lit up in the bottom a few hundred yards away! He continued to call for 15 minutes but couldn’t get them in. We decided to sneak up closer to where we had heard them and see if we could coax one in. We stayed up a little higher on the ridge. I took center and Dad and Mike watched two fingers on each side of me in case one of the coyotes tried to back door us. I started doing some wounded coyote sounds with my mouth call; it’s actually the squealing hen turkey call, but it works well to mimic a wounded coyote as well. After about eight minutes of blowing on the call, I heard something hit the barbwire fence to my right. Then about 10 seconds later I saw three coyote heads pop up from the bottom about 35 yards away! I stayed motionless, not making a noise, as I was positioned away from them and they were making their way up the hill towards Dad. They finally crested the hill enough for Dad to see one and he put the hammer down. 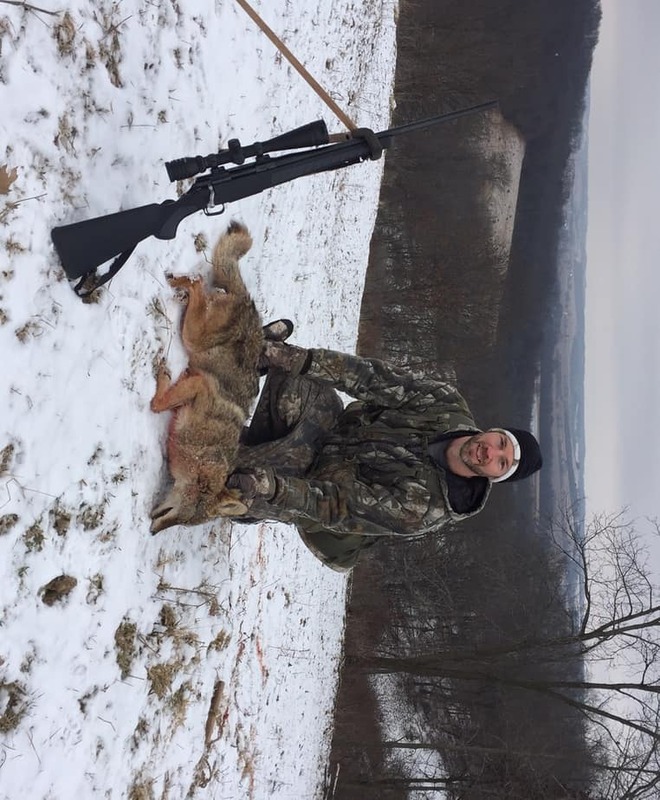 After the shot the other two took off running, and Dad and I squeezed off a couple more shots, but a running coyote at 30 yards with a scoped rifle isn’t an easy target! We got up and walked over the ravine and Dad’s coyote was lying right there. Heck yeah! we both yelled. It was a big male close to 40 pounds with a beautiful fur coat. Dad shot him with his Howa .223 using 55-grain Remington Premier Accutip varmint ammo. That was #3 for the day! We celebrated with a couple cold beers later that night at the lodge. Early afternoon on the second day Jason and Ryan set up on the same ridge top where I had shot a coyote on day one. 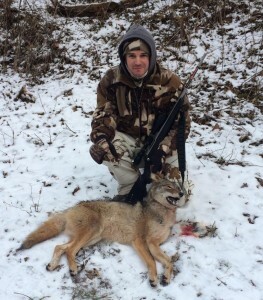 Jason was doing some hybrid calling with the FoxPro and mouth calls combined. He mimicked some female whimper/mating mouth calls, and followed up with some challenge howls from the FoxPro. 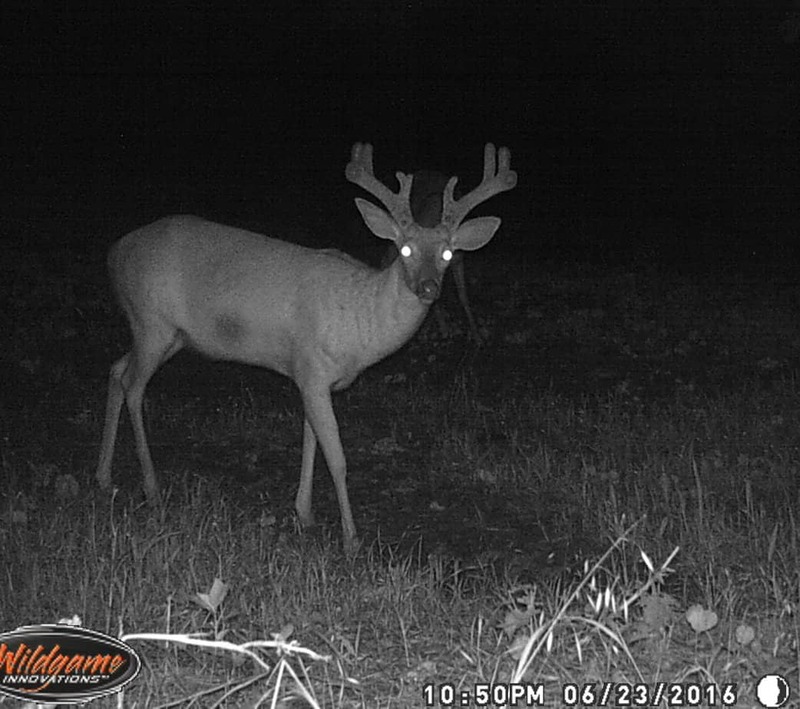 About 12 minutes in, he saw one trotting in along the bottom a good 200 yards away. He was waiting for Ryan to shoot because it was more in his direction, but Ryan could not see the critter from his position. Figuring this, Jason decided it was now or never before it got away. 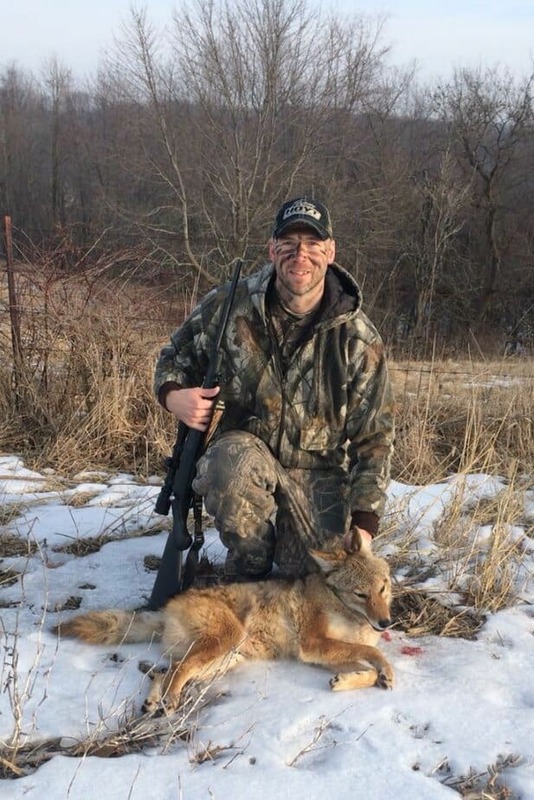 Jason took the shot at about 200 yards with his .22 Hornet and dropped the coyote in his tracks. It was a great shot through a small opening in the brush. Jason went down to the bottom and recovered his yote, another beautiful and good-sized male around 40 lbs. The 35-grain Hornady Varmint Express has been a great load with that rifle; this was the third coyote in two years that he has dropped with it. This is an underreported story, but potentially a bombshell. The indirect impacts of cats gone wild on larger wildlife are less obvious, but one of the greatest emerging threats from feral cats is infection with Toxoplasma gondii. A study published in EcoHealth found that feral cats, through their feces, are likely driving infections in whitetails in northeastern Ohio. The study’s authors collected deer samples from a Cleveland park, as well as cat samples from the area. 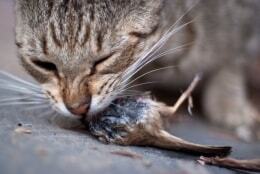 Nearly 60% of the deer and 52% of the feral cats tested positive for T. gondii. Older deer and deer in urban environments were more likely to be infected, which suggests transmission from extended environmental exposure. 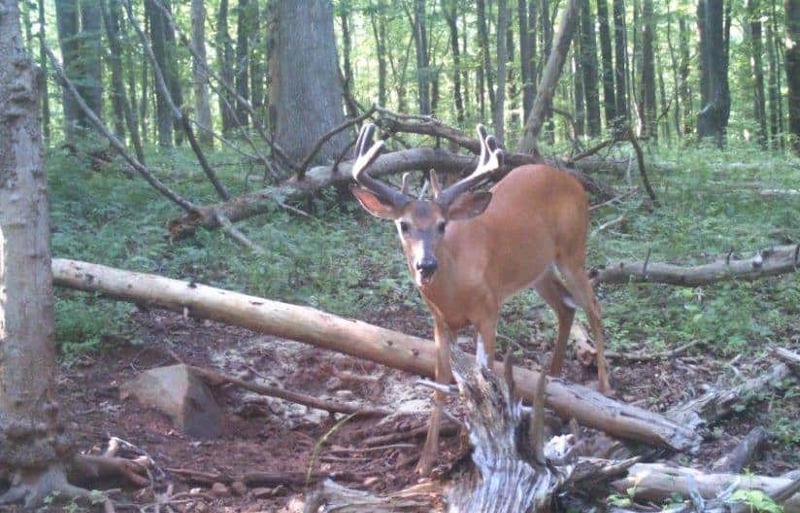 If these findings from Ohio prove to be more widespread, there are serious implications for people as well as deer. Experts say widespread environmental contamination increases the likelihood of human infection, which has been linked to schizophrenia and can lead to miscarriages, blindness, memory loss, and death. Also very concerning: People that consume undercooked venison from infected deer can also acquire T. gondii and the subsequent disease, toxoplasmosis. The Wildlife Society actively supports the humane removal of feral cats from native ecosystems. Should hunters kill free-roaming cats too? We shoot feral hogs that negatively impact native wildlife habitat, and other predators. What about feral cats? Tricky. I’m not saying go out and start shooting every cat you see, but like any predator in the wild they do need to be controlled.